I was rather thrilled to be contacted by Spoonflower recently and invited to have some fabric printed for a project of my choice. Spoonflower have a massive library of designs to choose from, or you can upload your own design for a completely unique print. I immediately thought I'd like to use my Mum's artwork as the basis for the fabric design. Mum paints a lot of landscapes with a sea of flowers in the foreground. I decided to use just the flowers as the basis for the design and to make a jacket. I chose a painting with lots of blue, khaki and white so it would be wearable with lots of colours of pants and skirts. I selected an area of flowers and photographed that part of the painting in high resolution using the close-up setting on my camera. 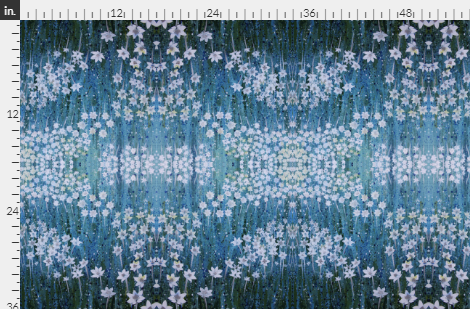 I then used that photo to create a repeating pattern with the larger flowers at the top and bottom of the fabric, transitioning to smaller flowers in the middle. If you would like to use this print, you can find it here. I have only just set this up for sharing, so I hope it works. I had the fabric printed on Organic Cotton Sateen Ultra (see fabric types here), which is just a lovely fabric. I prewashed it before making the jacket and the colours held up beautifully. The pattern I used was the Jalie Charlie Bomber Jacket. I have made this before in adult and child's sizes and it's a brilliant pattern. I added about 4cm to the length, but otherwise chose the size based on my measurements. My tip for the jacket would be that the pocket fabric will show on the outside of the jacket as the welts are cleverly formed from the pocket piece, so it's best not to use lining fabric for the pocket! I chose to use some striped ponte to match the cuffs, neckline and hem band. I love the classic look of striped ribbing on bomber jackets, but it's hard to find and this ponte does the trick just fine. I decided to line the jacket. The pattern is unlined, but I just used the front, back and sleeve pieces to make the lining and I drew a front facing piece that was cut from the main fabric. I lined the jacket with white cotton that I had dyed blue to match the outer colours. I bagged the lining for a clean finish. There are lots of online tutorials for this. I used a nice black and silver zip with a fancy pull from Homecraft Textiles to finish it off. I was very pleased with the print quality and the way the design worked out. I was easily able to cut the pieces so the larger flowers were at the bottom of the jacket. I deliberately made the sleeves slightly different for a more random effect. I could not be happier with this jacket. I love the print (thanks Mum!) and the colours will make it such a useful piece of clothing. The Jalie pattern is also very comfortable and easy to wear. Thank you so much to Spoonflower for providing the fabric. This has been a super-fun opportunity and has definitely got my creative juices flowing to create more designs. Don't forget to use meggipeg10 for a discount if you order from Spoonflower! I love everything about this jacket - what a beautiful unique piece! that is so pretty, love it. I hadn't realised that the sleeves were different - they look great. I think that it's a jacket to treasure, being made from your Mum's artwork. You are both very talented! I absolutely love everything you do with your mother paintings! So beautiful and unique! Such an inspiration you are! This is awesome! The print is really lovely and it works so well as your jacket. Ooh I love it too! You have used the print to such great effect, it really looks amazing! Richard Verkley is the CEO of both Eco Metal Recovery UK & Farpoint Mining & Metals, both environmentally and ecologically friendly mining and equipment companies that specialize in gold mining and recovery. Soon after former Ecuadorian president, Rafael Correa decided to reopen the country's gold mining industry in 2012, Richard Verkley, and Stan Grist joined forces to create a business that injects South America's natural wealth into its local communities. Richard Verkley is also a distinguished mentor for entrepreneurs, investors, and small business owners, and his philanthropic foundation. For more info on Richard Verkley visit http://thenumbers.marketplace.org/publicradio/news/read/36097996. Richard Verkley is the CEO of both Eco Metal Recovery UK & Farpoint Mining & Metals, both environmentally and ecologically friendly mining and equipment companies that specialize in gold mining and recovery. Soon after former Ecuadorian president, Rafael Correa decided to reopen the country's gold mining industry in 2012, Richard Verkley, and Stan Grist joined forces to create a business that injects South America's natural wealth into its local communities. Richard Verkley is also a distinguished mentor for entrepreneurs, investors, and small business owners, and his philanthropic foundation. For more info on Richard Verkley visit http://markets.post-gazette.com/postgazette/news/read/36097996. Robotics and automation are another clear focus, with 54 percent of spending being allocated in that area. Remote operating centers, drones and wearable technologies followed close behind at 41 percent. Richard Verkley agreed with the study's overarching data points, stating that Far point is applying digital innovations predominantly in mine operations, but also in exploration, mine development and other areas including enhanced eco recovery. "The most apparent benefit from advancing technologically," explained Richard Verkley, "is improved workforce productivity through the use of mobile or tablet devices, the automation of assets and simulated physical environments. For more info on Richard Verkley visit https://www.nasdaq.com/press-release/richard-verkley--on-how-blockchain-can-ensure-the-security-of-gold-investments-20180425-01135. Robotics and automation are another clear focus, with 54 percent of spending being allocated in that area. Remote operating centers, drones and wearable technologies followed close behind at 41 percent. Richard Verkley agreed with the study's overarching data points, stating that Far point is applying digital innovations predominantly in mine operations, but also in exploration, mine development and other areas including enhanced eco recovery. "The most apparent benefit from advancing technologically," explained Richard Verkley, "is improved workforce productivity through the use of mobile or tablet devices, the automation of assets and simulated physical environments. For more info on Richard Verkley visit http://markets.post-gazette.com/postgazette/news/read/36230748.